Just as you can easily create regular expressions with RegexMagic, use RegexMagic's handy code snippets to instantly use the regular expressions in your source code. Anything can be done: testing a string for a match, extracting search matches, validating input, search-and-replace, splitting a string, querying databases, etc. Each regular expression engine has its own regular expression flavor. They all differ in the features they support and the syntax they use. Differences between modern flavors are subtle and sometimes confusing. Older flavors often lack features that have become standard. 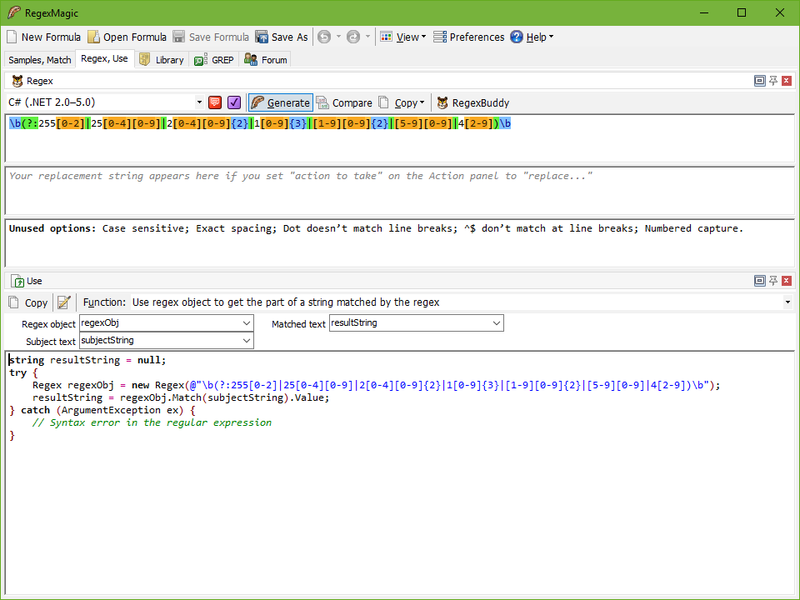 RegexMagic can generate regular expressions for the specific flavor used by all the programming languages it supports. You don't have to worry you'll get different results in your actual program than in RegexMagic. Rely on RegexMagic to handle all these details. Just select the language you are working with, and the action you want to perform. Test whether a string matches a regex, extract matches from a string, search and replace, split a string, etc. 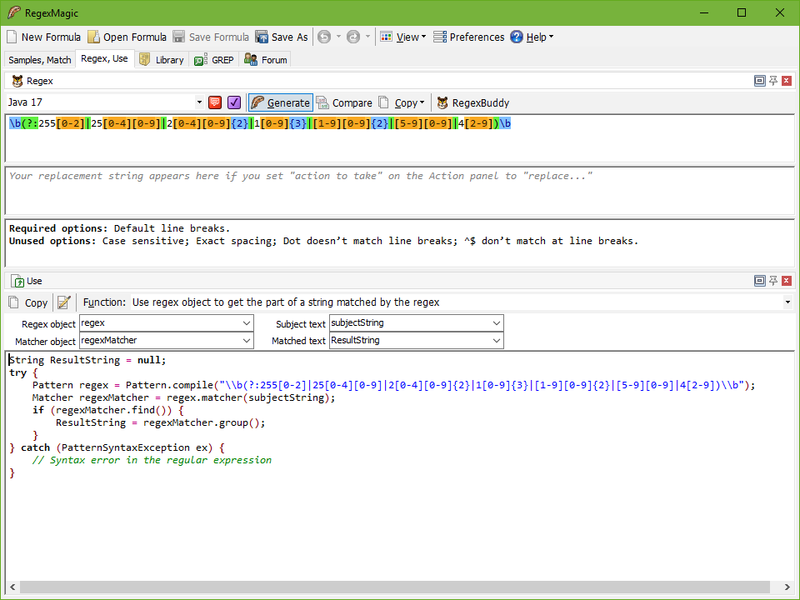 RegexMagic knows all the common regex actions and how to perform them with a variety of programming languages. If the provided source code snippets don't support your coding style, use the built-in template editor to edit the snippets RegexMagic generates. You can add as many templates as you like to create snippets for everything you do with regular expressions in your applications. You can even create whole new templates for other languages not supported by RegexMagic. This is perfect for using regular expressions with in-house tools and scripting solutions. 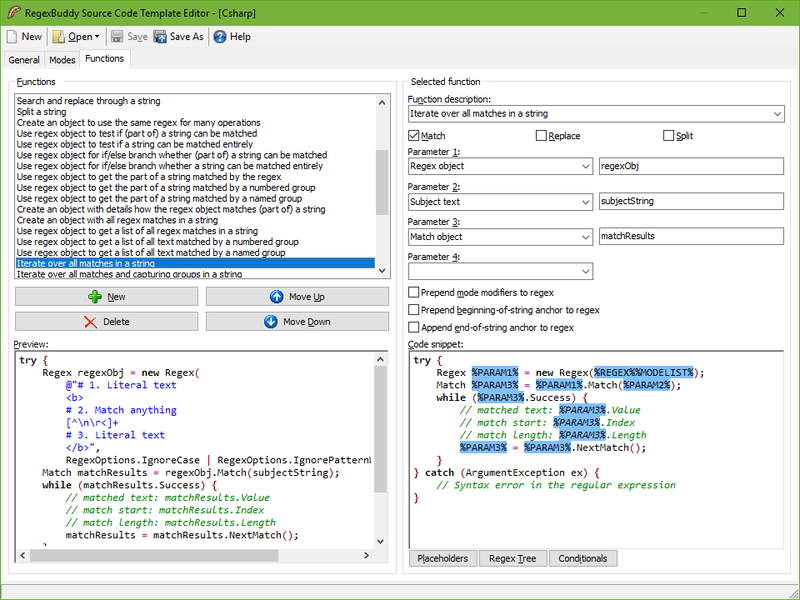 If your language uses a standard regex engine like the open source PCRE or the regex classes built into .NET or Java (or any other flavor supported by RegexMagic), your custom source code templates will have all the automatic conversion abilities that the templates included with RegexMagic have.